Those of us living in the industrial world waste more than we should, but what if some of the things that we waste could become something new? Maybe you haven’t heard that at least 25% of our food goes to waste. In the US, household water leaks amount to 1 trillion gallons of wasted water annually, and energy consumption is on the incline. Sadly, it is unlikely that we’ll quickly reduce these wastes. So what if we better utilized our waste? Arthur Kay and his UK company bio-bean are doing just that, putting waste to good use. How so? Bio-bean is the first company to recycle coffee grinds into biofuel. Image your morning fuel of coffee getting a second chance to fuel your house or perhaps car? Sound too futuristic? Read on! Like the forestry, fishing, and brewing industries, the grounds from making coffee can be processed into by-product biofuels. Coffee grounds produce oil and fibrous byproducts. For a firm like bio-bean, the fibre of coffee grounds is processed into biomass pellets and coffee logs. The pellets and logs are used for wood fires, furnaces, stoves and BBQs. Typically in North America we do not individually heat our houses or cook with fire. However, we consume electricity that is fueled by coal, natural gas, petroleum, biofuels and renewable energy. In 2013, Canadians consumed 533 billion Kwh, in which only 25 billion (4.7%) came from non-hydroelectric renewable energy. Perhaps the use of coffee grounds could be used to generate a form of ‘renewable’ power and offset our dependence on coal and other a non-renewable energy sources we extract from our planet. Canadians love their coffee! Ranking third behind the Netherlands and Finland, per capita, Canadians drink 152 litres a year. According to the Coffee Association of Canada (CAC), last year two-thirds of Canadians drank coffee every day, averaging 3.2 cups each. That means in 2015 Canadians consumed roughly 60 million cups of coffee a day. Let’s assume we all follow Starbucks perfect cup recommendations of 2 Tbsp = 10 g per cup (6 oz), therefore producing nearly 600 tonnes of coffee grounds are used each day in Canada alone. With no signs of declining coffee consumption, 600 tonnes of coffee ground waste per day could be used as biofuel (assuming logistically it could all be collected). In the UK, bio-bean collects and processes about 10% of all consumed coffee grounds, 50,000 tonnes. This allows them to process enough pellets/logs to fuel roughly 15,000 UK homes each year. Collecting coffee grounds in Canada would be a logistical nightmare as 7 out of 10 cups are consumed at home. However, it’s an option for the cafe industry. In fact, waste recycling is an option for many industries to consider, from our beer brewers to our fisheries. By reusing our waste, we can offset our reliance on non-renewable resources. Currently, bio-bean is hoping to produce a vehicular biodiesel for the market. 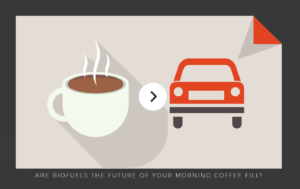 Who knows maybe in the future our coffee can fuel us and our cars on our way to work.